With snow covering the ground here in the DFW metroplex, it's had my son talking about Christmas every day. He seems to think if there is snow, there is Christmas. And if it's Christmas, "Santa is coming!!" 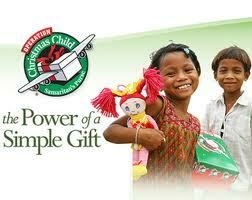 When I started couponing last year, I read about Operation Christmas Child on a blog. The blog writer saves some of her goodies & freebies that she collects throughout the year in order to pack up some shoeboxes for Operation Christmas Child. Their mission is "To demonstrate God's love in a tangible way to needy children around the world, and together with the local church worldwide, to share the Good News of Jesus Christ." Now if you've been couponing for a little while, you know there are all kind of freebies out there. It's not hard to accumulate all kinds of stuff, much of which can be donated. This year, my goal is to participate in Operation Christmas Child, and to hopefully have my children help me pack up some shoeboxes to share some love with children that are less fortunate. It gives me *warm fuzzies* just thinking about what an impact it could have. If you're looking for some good to do, and are interested in checking it out, please view their website HERE! Update: 2012's collection week is November 12th-19th... so plenty of time to build up a little stockpile!